Someone needs to publish or post a good summary for the layman, with perhaps bullet points of what Bill C-51 entails. So many websites I have gone to are filled with opinion that just rambles on ad nauseam. I am more confused than ever! Anyone who reads this blog knows how hard this assignment will be for someone as inclined to over-explain as I. But I’ve tried. Bill C-51 is overly broad, so it can be made to mean anything the authorities want it to mean. Bill C-51 dispenses with the need to get evidence before targeting suspects. 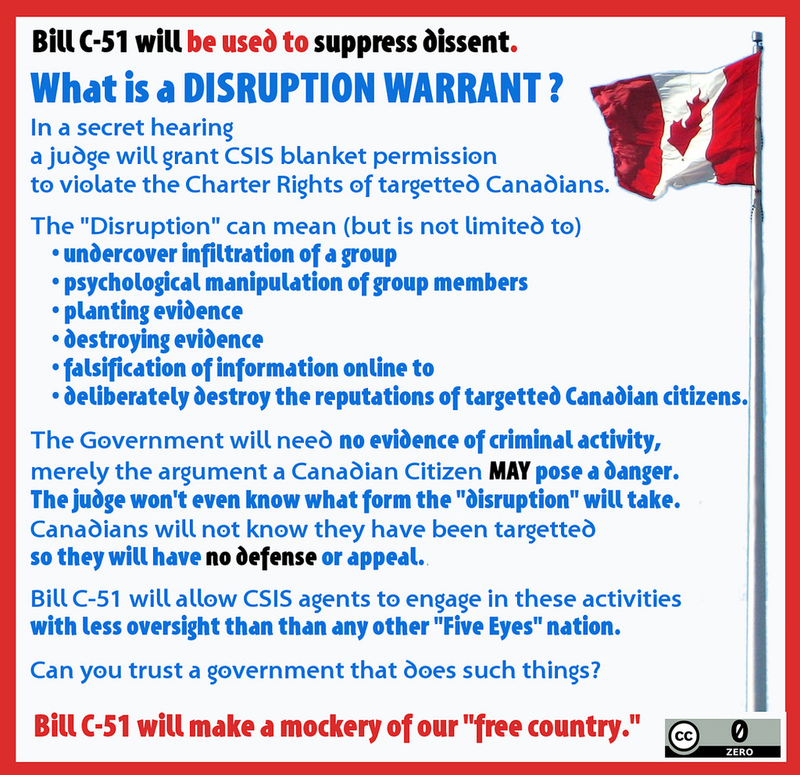 Bill C-51 introduces the “constitutional breach warrant” granting permission to breach civil rights in advance. Bill C-51 dispenses with citizen privacy by allowing indiscriminate unsupervised information sharing. Bill C-51 will put all Canadian citizens at risk of secret trials. Bill C-51 will render our civil rights protections meaningless by allowing CSIS to breach law or the Charter. Bill C-51: What Did We Learn About The Government’s Intentions From The Clause-By-Clause goes into this in much more detail. Bill C-51 expands the government’s ability to spy on Canadians without any oversight. Bill C-51 makes the no-fly list (already an incursion in the Charter’s mobility rights) even worse. Bill C-51’s vagueness threatens free speech because it allows arbitrary censorship at the whim of government. *The rule of law is the legal principle that law should govern a nation, as opposed to being governed by arbitrary decisions of individual government officials. A big part of the problem is that there is no time. But when the entire legal profession, information technology folks, the Government’s own Privacy Commissioner (and every other Canadian Privacy Commissioner past and present), civil rights organizations at home and abroad, along side a vast array of ordinary people from all walks of life and across the breadth of the Canadian political spectrum opposes a law, it should not pass. P.S. The only way a law like Bill C-51 could have gotten this far is because our unfair outdated electoral system puts absolute power into the hands of any majority government. Bill C-51 would not have a hope if we had Proportional Representation. With the exception of the Conservative and Liberal Parties, every one else wants to adopt meaningful electoral reform. So no matter what, and no matter who for, every Canadian needs to vote in the fall election. Among the vast amount of material already out there, I have covered Bill C-51 as extensively as possible here in Whoa!Canada, (just read back… you might like Our Kids Deserve to Have Civil Rights, but there are a lot more, just read on) and I’ve have shared copious links and articles like “What is a Disruption Warrant” on Visual Laurel. My Bill C-51 YouTube playlist features important snippets of things I’ve learned from ordinary people. Privacy is an incredibly important human right, necessary for the “security of the person.” Former Privacy Commissioner Jennifer Stoddart published a list of excellent movies that dealt with the Privacy issues we increasingly face. 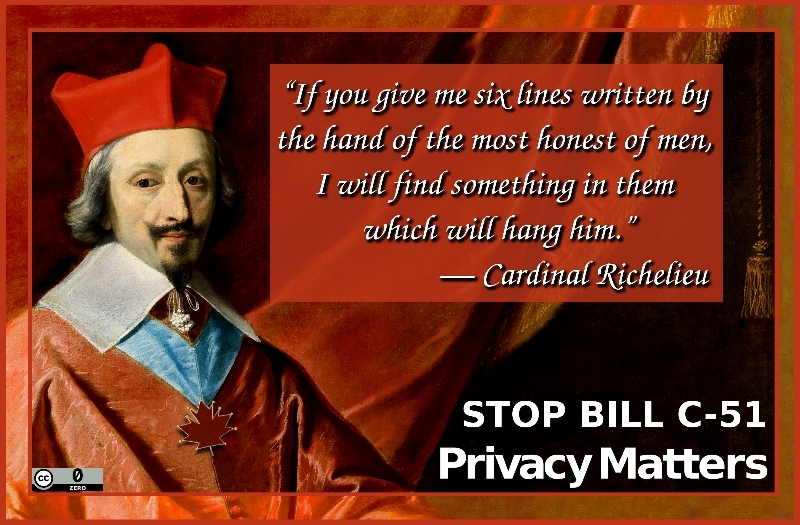 These films demonstrate the importance of privacy matters, and why Bill C-51 must not pass. ← Who Voted for C-51… Is my math right?